Bought these through a group buy with another car club last year. KVR cross-drilled & cryo-treated front rotors and KVR carbon fibre brake pads. Noticed last week they were squealing and the rotors has been warped for at least the past 4 months, reciently getting very bad. Replaced them last night with crapy-tire cheapies. Completely rotted on the inside and the pads were almost gone! Calipers were not seized. Caliper slides are working perfectly. Anyone have an idea of why they rotted so fast??? I don't understand how they wore out so fast. I do drive alot but they should have lasted alot longer IMO. that doesn't look too good, I was going to pick up some KVR blanks / Pads instead of a better but more $$ option. on the other hand, how did you like the performance and did they make noise before getting warped / rotten? They worked great...no fade, no noise. I just noticed they started to vibrate under heavy or higher speed braking and they just got worse from there. That was about 4 months ago. 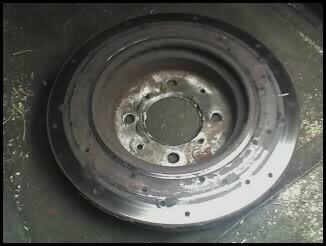 I don't think I'll buy those rotors again, but the pads were very good. I recommend the pads for sure. Just don't know why they rotted so fast. My car never sits more than a day, I drive alot. how about performance vs stock pads / rotors? was the stopping power noticibley better? The performance wasn't any better than stoke, however, they didn't fade like regular brakes. My past experience with extremely hard braking on the stock brakes resulted in severe brake fade to the point where I litterally had NO BRAKES...it boiled the fluid basically. The KVR's on the other hand, stay much cooler an never faded at all. I spoke with another person why bought these brakes in the group buy, his only lasted about 15kms. So maybe they were so cheap for a reason??? Even though they were rotted and warped, they still worked well. LOL. Racoon ran out infront of me yesterday and I slammed the brakes, locked all 4 and stopped on a dime. Don't know where they got them from. Turns out from talking to some of the guys from the other club, they may have been cryo-treated wrong causing water to get into the material creating hair-line fractures and causing the rotor to rust much faster....or something along those lines. but in the end it sounds like it was not a problem with the rotors them selves but in the cryo-treating process.